The Auschwitz Institute for Peace and Reconciliation (AIPR) successfully held the latest edition of the Global Raphael Lemkin Seminar for the Prevention of Genocide between Sunday, November 6 and Sunday, November 13 in Oświęcim and Krakow, Poland. This year, AIPR was honored to welcome 24 participants from countries around the world including Argentina, Bolivia, Colombia, Costa Rica, Germany, Guatemala, Kenya, Luxembourg, Malaysia, Morocco, Nepal, the Netherlands, Peru, Slovenia, Tanzania, Thailand, Tunisia, Uganda, Uruguay, and Zambia. In addition to AIPR staff, the Seminar involved the participation of 9 Raphael Lemkin Seminar Fellows in Residence, who taught several modules throughout the week, with 4 observers in attendance as well. Consistent with previous years, the week of the seminar was divided up into different thematic days. 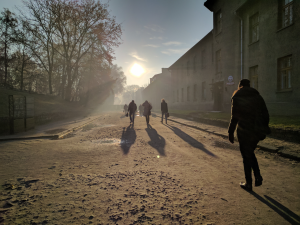 Monday and Tuesday were dedicated to the “power of place” of Auschwitz, with historical modules and an introduction to the concept of genocide, taught by Dr. James Waller, AIPR’s Director of Academic Programs, as well as the guided study visits to Auschwitz I and Auschwitz II-Birkenau. The third, fourth, and fifth days were dedicated to prevention before, during, and after conflict has occurred. 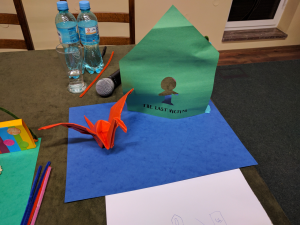 The sixth and final day of the seminar was dedicated to a simulation exercise that brought together the lessons and concepts covered throughout the preceding week. On Monday and Tuesday, participants attended modules that covered the concepts of genocide, mass atrocities, and their prevention. Classroom modules held ahead of guided study tours of Auschwitz also provided important context for the first two days, including sessions dedicated to the history of the rise of Nazism and the Holocaust, taught by Dr. James Waller, and a presentation entitled “Between Memory, Commemoration and the Authentic Site: Auschwitz as a Reference Point for Contemporary Societies,” by Dr. Marek Kucia. Sessions on Wednesday, Thursday, and Friday were dedicated to themes related to the upstream, midstream, and downstream prevention of genocide and mass atrocities, respectively. Following an introduction by Dr. Waller, Wednesday’s sessions included presentations by Dr. Claudia Diaz of the UN Office of the Special Advisers to the Secretary-General on the Prevention of Genocide and the Responsibility to Protect on Early Warning Mechanisms and the Responsibility to Protect and a new module on the Role of National Mechanisms in Genocide and Mass Atrocity Prevention, presented by Dr. Ashad Sentongo and Ms. Samantha Capicotto. 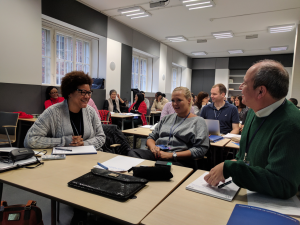 On Thursday, attendees participated in an activity on identity led by Mr. Vahidin Omanovic, of the Center for Peacebuilding in Sanski Most, Bosnia and Herzegovina before Dr. Waller delivered his module entitled “Becoming Evil: How Ordinary People Commit Genocide and Mass Atrocity”. The day was concluded by Ms. Debbie Stothard, who gave participants a wide-reaching update on the contemporary situation in Burma, an interactive activity on response tools for prevention, and a regionally-focused network mapping exercise. Friday’s modules, dedicated to downstream prevention, featured an introduction to Transitional Justice by Dr. Tibi Galis, AIPR’s Executive Director, a case study on Transitional Justice in the Middle East and North Africa, led by Dr. Christalla Yakinthou from the University of Birmingham, and a case study on Truth, Justice, Reparation and Memory in Argentina by AIPR’s Senior Advisor for Latin American Programs, Ms. Andrea Gualde. The day was concluded with module on the Role of Memory and Memorialization in Transitional Justice. 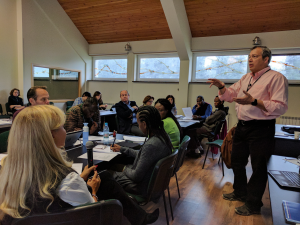 The Seminar’s final day began on Saturday morning with a Capstone Simulation exercise, run by Dr. Waller and Dr. Tibi Galis. This module gave all of the participants an opportunity to revisit and apply the concepts, actions, and best practices that they discussed throughout the week. Following an overview of AIPR’s 2Prevent Alumni Network by Ms. Capicotto, the Seminar’s official closing included a ceremony to mark the signing of a new Memorandum of Understanding (MoU) between the Ministry of Autonomies of Bolivia and the Auschwitz Institute. 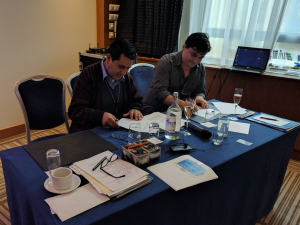 The document was signed by Mr. Henry Baldelomar Chávez from the Bolivian Ministry of Autonomies and by Dr. Tibi Galis, representing AIPR. This MoU provides a framework for cooperation between the two organizations and represents an exciting opportunity for the development of new initiatives for prevention. The next edition of the Global Raphael Lemkin Seminar for Genocide Prevention is scheduled for November 12-19 of 2017. For details on the 2016 edition as well as previous Global Lemkin Seminars, click here.